President Lincoln visited Gettysburg without his family, having left his frantic wife and sick son behind in Washington. When Edward Everett wrote Lincoln after the event, he said, "I hope your anxiety for your child was relieved upon your arrival." By then his son had improved, but Lincoln had a mild form of smallpox. Lincoln used the second-floor guest bedroom above David Wills' law office. 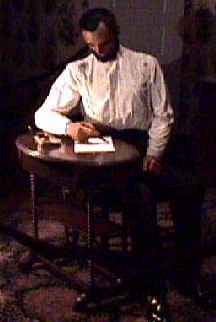 Here he put the finishing touches on his carefully prepared Gettysburg Address, a speech he began writing in Washington. Despite old stories, it's not true that Lincoln wrote the speech on the train, much less on the back of an envelope. This picture was taken before the home was restored by the National Park Service.